In the absence of the protein biglycan, synapses at neuromuscular junctions in mice began to break up about five weeks after birth, according to a new study led by Brown University researchers. 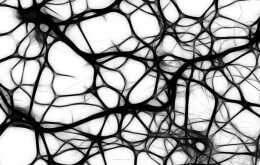 Reintroducing byglycan helped fix the loss of synaptic stability in cell culture. The research may be relevant to efforts to treat motor neuron diseases, such as amyotrophic lateral sclerosis (ALS, Lou Gherig’s Disease) and spinal muscular atrophy. The protein biglycan needs to be present to stabilize synapses at the neuromuscular junction after they have formed, according to research led by Brown University that appears in the Feb. 14, 2012, issue of the Journal of Neruoscience. Now Fallon’s research group has found another important role for biglycan. 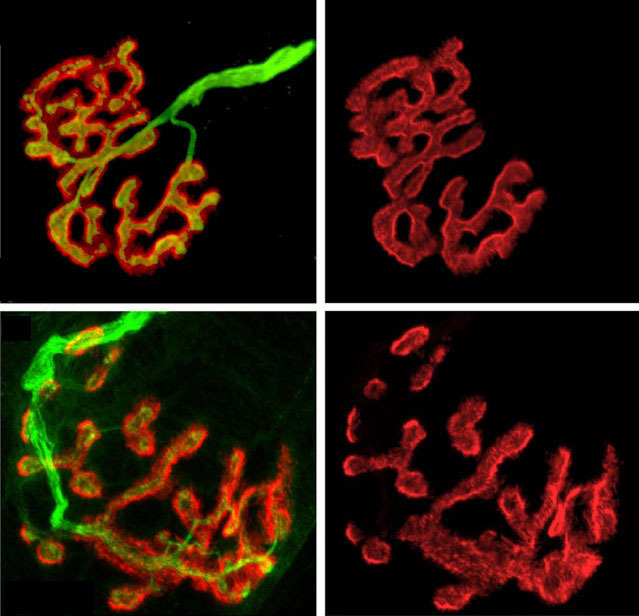 In the new multi-institutional study, lead author Alison Amenta and a team of other scientists found that biglycan binds and helps activate and target a receptor enzyme called MuSK, which works like a foreman or master regulator over other proteins that build and stabilize the neuromuscular junction. Mice engineered to lack biglycan developed normal junctions at first, but by five weeks after birth their synapses became much more likely to break into fragmented shadows of their former selves. In experiments the scientists saw that up to 80 percent of synapses in biglycan-lacking mice were unstable. Biglycan-lacking mice also showed other structural defects including misaligned neurotransmitter receptors and extra folds near synapses. “We think it is most likely that these folds are remnants of previous synaptic sites,” that have since withered, the authors wrote in the paper. Amenta, Fallon, and their team also found that in mice lacking biglycan, levels of MuSK at neuromuscular junction synapses were reduced by a factor of more than 10. In another experiment, they found that recombinant biglycan could rescue the stability of synaptic structures in model cell culture system. The findings help set the stage for testing biglycan as a potential therapy in animal models of motor neuron disease, Fallon said. “As an extracellular protein that can be delivered systemically that acts to stabilize the neuromuscular junction, we propose that biglycan could be a protein therapeutic for motor neuron diseases such as spinal muscular atrophy and amyotrophic lateral sclerosis, or ALS,” Fallon said. In addition to Fallon and Amenta, other Brown authors include Hillary Creely, Mary Lynn Mercado, Hiroki Hagiwara, Beth McKechnie and Beatrice Lechner. Other authors are Susana Rossi, Emilio Marrero and Richard Rotundo of the University of Miami; Qiang Wang and Lin Mei of the Medical College of Georgia; Rick Owens and David McQuillan of Lifecell Corp.; the late Werner Hoch of the University of Houston; and Marian Young of the National Institute of Dental and Craniofacial Research. Several grants from the National Institutes of Health and support from the Muscular Dystrophy Association funded the research.